Danielle Chavez is currently attending the Walter Cronkite School of Journalism and Mass Communications at Arizona State University under a 4-year scholarship. She is pursuing a joint Bachelors and Master's degree in Journalism and Mass Communications with an emphasis in Public Relations. Danielle was born in Denton, TX and has lived in Brownsville for the majority of her life. Although she claims to have not been interested in politics until the 2008 Presidential Election, Danielle has always agreed strongly with politically conservative viewpoints. She enjoys political discussions with her peers and informing others about her right-winged views. Danielle's involvement in conservative politics began during the 2008 President Election when she served as a volunteer at local GOP headquarters. She went on to co-found a Republican club at her high school and a political blog: Write for the Right. Danielle has served as a volunteer and speaker at the April 2009 TEA Party Protest in Brownsville, TX and has been a guest on "Canto Talk" on BlogTalk Radio. 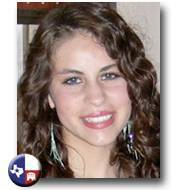 Danielle aslo blogs for Texas GOP Vote. Danielle is currently serving as Vice-President of the newly-founded College Republicans chapter at the ASU Downtown campus.